The upcoming Sept. 11 launches have been re-shuffled. 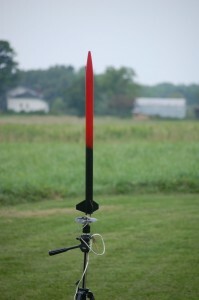 Perseus Booster “Columbia” will return to the launch pad to test out its new motor mount system, and altimeter systems. Perseus Booster "Columbia" on the launch pad (without its payload bay). The August 28th. high power launch caused some slight damage to Columbia’s airframe, and repairs were just completed today, along with a new motor mount system to replaced the one damaged by the same high power flight test. Many of the changes to the Perseus Booster “Columbia” will be incorporated in the next few Perseus boosters slated to be built sometime this fall. Meanwhile, Perseus booster “Eagle” is being retrofitted to fly a boilerplate avionics bay. This will test the flight handling characteristics of the booster with the weight and mass of the proposed electronics bay that will be used for high altitude flights that will employ a dual deployment recovery system. Work is happening quickly as this flight mission is also scheduled for Saturday, Sept. 11th. We will update all activities for the patriot Day launches by mid week. In the meantime, the countdown has been started!